3. When is it best to travel to Cambodia? You can travel to Cambodia all year round. During the European winter it is the dry season in Cambodia, when the temperatures are extremely pleasant. For this reason, there are many tourists at the major attractions and on the beaches in Sihanoukville and Kep during this period. In our summer months, the temperatures in Cambodia are higher. It is also at this time of the year that most of the rain falls there – which means that dust is not a problem, and there are far fewer tourists. The sights and attractions remain fully accessible, though, and you could claim with some justification that Angkor Wat is particularly attractive when the moats are full to the brim with water and all the plants are a rich green colour. NB: the central tower of Angkor Wat is closed to tourists on the holy days in the Buddhist calendar. The official language of Cambodia is Khmer, but as a tourist you can certainly make yourself understood in English. In the same way as for other international travel, you must be in possession of a valid UK passport. Your passport must be valid for at least 6 months after departure from Cambodia. As a UK citizen, you can obtain a visa in two ways: either electronically or on your arrival in Cambodia. Read more about how to apply for an electronic visa here: www.evisa.gov.kh. The price of an electronic visa is 30 USD + fee of 7 USD, payable by credit card. Your visa will be sent to you by email, and it should be printed out and brought with you to Cambodia. Please note that your visa is valid for 3 months after the date of issue and that your entry into Cambodia should therefore be within this period. Your visa is valid for 30 days from the date of entry. Please note: If you are sailing from Chau Doc in Vietnam to Phnom Penh in Cambodia, electronic visas are not accepted. Visas can therefore only be obtained upon your arrival at the port of Cambodia. If you prefer to apply for a visa via the Royal Embassy of Cambodia in London, you can read about the application process here: www.cambodianembassy.org.uk under the header ‘Visa’. Of course, you are also welcome to contact us for advice. The unit of currency in Cambodia is the riel (KHR). It is a protected currency, which means you cannot buy it in advance and will have to exchange currency in Cambodia. Visit www.xe.com/currencyconverter to see the current exchange rate in both US dollars and euros. We recommend that you bring some US dollars with you in cash (ideally large denomination notes – USD 20, 50 or 100 USD), and exchange them at an official bureau de change on arrival in the country. You should not expect to be able to exchange a large denomination American note for smaller denomination notes. We therefore recommend that you bring some American dollars in small denomination notes as well (USD 1, 5 and 10). Many places actually prefer to receive payment in US dollars. However, if the price of what you wish to buy is less than USD 1, the vendor will usually want to be paid in riels. You should not have any problem using common credit cards such as Visa and MasterCard in the cities of Phnom Penh, Siem Reap, Battambang and Sihanoukville, where cash machines (ATMs) are also becoming more common. It is unusual to encounter ATMs outside these cities, however, and you should not count on being able to use your credit card in very many places – although most hotels and will accept credit cards, as will many restaurants and shops. Please note that there are a lot of shops selling precious stones in Cambodia. We recommend that you avoid buying such stones here, as there are a great many fakes in circulation. Our guides do not take our customers to precious stone shops, and any precious stone purchases you may make are on your own responsibility. The price level in Cambodia is generally lower than in Europe. The guide below applies to the cities. Prices are typically lower in rural areas, where the range of options also tends to be more limited. The difference between Greenwich Mean Time (GMT) and the time in Cambodia varies between UK summer and winter time. Summer time: +4 hours. This means that when it is noon GMT, it is 16.00 in Cambodia. Winter time: +5 hours. This means that when it is noon GMT, it is 17.00 in Cambodia. Cambodia has neither standardised power nor standard plugs. This means that you may encounter mains electricity of anywhere between 110 and 230 volts. The plugs will either have two round pins or three flat ones. Therefore, make sure to bring a travel adapter with you if you will need to recharge your camera, phone or laptop. The international dialling code for Cambodia is +855. It can be expensive to place calls to – or receive them from – Europe while you are in Cambodia. Ask your own mobile service provider about coverage and call charges. If you need to make lots of calls or to send a lot of text messages, it may be a good idea to buy a local SIM card. There are internet cafés in the big cities, and Wi-Fi connections in most hotels. Cambodia is generally a very safe country to travel in. Crime involving tourists is typically limited to isolated incidents of pick-pocketing, and can usually be avoided through the application of common sense. Try not to show off expensive jewellery and large sums of cash. Large numbers of land mines were laid in Cambodia during the War of Indochina, and there are still areas that have not been cleared of mines. However, these areas are far away from the places our tours visit – and generally outside the typical tourist areas. The majority of the non-cleared areas are stretches of rural land (paddy fields) in the northern and western corners of the country. Khmer cuisine is considered to be some of the healthiest in the world. The food smells good and tastes wonderful. It is very healthy and calls to mind Thai cuisine – although it is not as hot and spicy. It is also heavily influenced by Vietnamese dishes on account of the history the country shares with French Indochina. The best-known Khmer (Cambodian) dish is called ‘amok’. This is a traditional curry, prepared using coconut and (usually) fish, although a chicken variant is sometimes served. We use many different airlines for our flights to Cambodia, so there may be variations in the amount of luggage you are allowed to bring with you as both checked luggage and hand luggage. Check the information about this on your airline ticket, and contact us if you have any questions. If your tour involves a domestic flight in Cambodia, you cannot bring more than 20 kg of luggage with you. On arrival at the different airports in Cambodia, you will be met by our local representative who will be waiting for you in the arrival hall with an Asiatours.co.uk sign. You will naturally also be driven to the airport on departure. 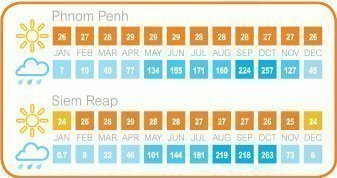 You will be informed of your pick-up time when you arrive in Cambodia. Experiencing differences in culture and etiquette is one of the delights of travelling, and it is essential to respect these differences. ‘When in Rome, do as the Romans do’ is good advice, and the section below contains a number of useful hints and tips intended to help you make the very most of your visit to Cambodia. Try not to show anger. Displaying frustration or anger by shouting or acting rudely is considered extremely impolite and disrespectful – and nothing good will come of it. Being shouted at is the same as losing face, which is something the Cambodian (Khmer) people do not like. Take your shoes off before entering a house; there are exceptions to this rule, however, so look for shoes next to the door. If there are shoes there already, you should take yours off before entering. Cambodians greet one another by bowing slightly with their hands pressed together as if in prayer (without intertwining their fingers). It is more polite for the younger person to initiate the greeting. For foreigners and in business situations, a (European) handshake is commonly accepted. Do not touch children on their heads, as this is considered to bring bad luck. (Cambodian people touch their shoulders or arms instead). If you visit a monastery (vihara), take your hat and shoes off before you go inside. Do not point your fingers at people and take special care not to point at Buddha figures. If you sit down in front of a ‘dai’ (a Buddhist altar), make sure to sit with your feet to the side so that they face away from Buddha. In Siem Reap and Phnom Penh, it is most usual to take taxis to and from the airport, for a fixed price. ‘Reumork’ (the Cambodian equivalent of the tuk-tuk) are used in towns and cities, and typically cost USD 1–3 per journey in Siem Reap and USD 2–5 in Phnom Penh. In both cities, short tours (i.e. less than 1 km) cost around USD 1, although prices are generally a little higher in the evening. Motorcycle taxis are also available in Cambodia. We recommend that you avoid these, however, as they are often involved in traffic accidents. Some parts of Cambodia are very poor, and our local partner has given us the following guidelines regarding donations and gifts. The only exception to this rule relates to disabled people and the elderly; it is OK to give them a few coins.